Editor’s Note: Since the early 1900s countries around the world have celebrated International Women’s Day as a time to recognize the role of women in society and mobilize against injustices specifically impacting half of the world’s population. At Enough, rather than confining our commemoration to just one day—March 8—we’re giving a special focus to women all this week, to highlight how the conflicts we’re working to end affect women and girls, and to recognize the work of heroes advocating on their behalf. 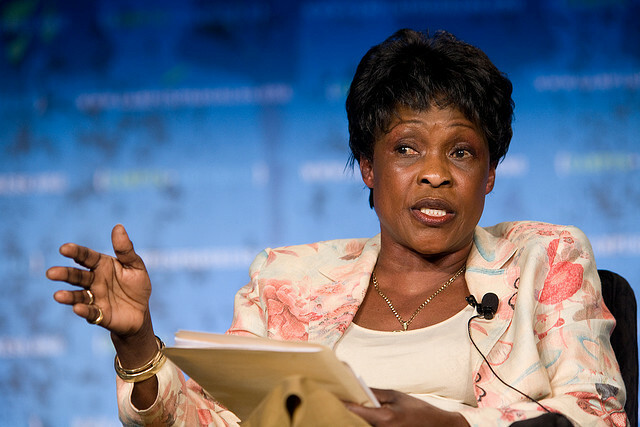 For Day 1 of our International Women’s Week coverage, Enough’s Kampala based LRA researcher Kasper Agger spoke to Betty Bigombe, Ugandan cabinet minister, member of Parliament, and longtime advocate for survivors of the LRA. The Enough Project sat down with Betty Bigombe to learn more about her tireless efforts to create peace in northern Uganda. Bigombe is one of the few who have travelled deep into the jungle to meet face to face with the notorious leader of the Lord’s Resistance Army, Joseph Kony. Enough: I understand you grew up in Gulu, northern Uganda—where the LRA first emerged—in a family with nine children. What are some memories that characterize your childhood? Bigombe: I am the seventh born. That means you feed yourself, you take care of yourself. I grew up in a very humble setting. My mother was working at home and my father was a medical assistant, but he died. I was six years old then, there was no [money for] school fees. It’s what they call child labor—you have to fight for yourself—to pay my way to school. I am the girl that walked four miles to school and four miles back. One meal a day, walked to fetch water, walking with the 20-liter jerry can on my head, collecting firewood. We grew up in a polygamist society—my father was no a polygamist; my mother was too strong for him—but we grew up where our maternal uncle had eight wives and we all lived in the same homestead. Everything was very communal. Food was cooked by all the women. In the evening, when the one meal for the day was served, they would hit the metal rim of a car wheel and we all ran towards the food and the boys would push you off. So you had to fight for your food. Enough: Fast forward to 1986 where you became deputy minister for the Office of the Prime Minister, assigned to northern Uganda. You became heavily involved with the peace talks between the Ugandan government and the LRA. Could you tell me more about that? Bigombe: Not involved, I initiated it. I am the one who convinced the president [Yoweri Museveni]. When he sent me up North, my mandate was to persuade the people of Acholi, Lango, and Teso to stop fighting, but there were no initiatives. By sitting in IDP camps, listening to people, I realized two things. One, that even if Kony is crazy, there were issues that needed to be addressed by the government and could best be done through peace talks. Two, the UPDF [Ugandan army], or NRA at the time, were not fighting. Senior officers were profiteering from the war, so they didn’t want the war to end. So it was not going to end; it was just going to drag on. I believe that to have sustainable peace you have to talk to your enemy, so that you can address underlying causes of the conflict. So I went there and listened and listened, to see if I could get both sides to be part of the peace process. But I cannot tell someone, “End the war,” when I don’t know what’s in your heart. So I said, “Tell me everything,” and I became a very good listener. We would sit all night long and then eventually settled down for serious talks. Enough: Do you have a story or an incident with a specific woman that has especially motivated you in your work for peace? Bigombe: To tell you the truth, what really motivated me was to see the pain women went through. They were looking after the sick; they were the major targets. Some of them were being blown up by landmines because they were going [to the field] to supplement what they were given in humanitarian aid. And each time I arrived [in the camps] it would give them hope, they smiled, and they begged me to stay longer. Enough: How was it for you being a woman in the very male-dominated environment of rebels and soldiers? Bigombe: There was a lot of hostility when I first went [to northern Uganda]. The Acholi people looked at me as a traitor. Here I am, one of their own, serving a [minister from western Uganda], a Banyankole. So people said, she is not one of us. There was hostility even from my own family members who thought, how could I betray them? How could I accept an appointment with Museveni? Then the other thing was being a woman. At that time I was much younger so I looked like a girl. [People thought] if Museveni was serious about ending the war he would not send a girl. What does she know about war? What is she going to do about it anyway? Then the [LRA] rebels wrote a very strong letter: ‘This is a male domain; if you step here we are going to kill you. Museveni don’t want to end the war, if he is sending a woman. He is insulting us even more.’ That was the general reaction. Enough: Do you think being a woman has given you any advantages? Bigombe: Advantages later on, the stamina to do things. How [the survivors] saw that I related to them, how I stayed in camps with them and suffered, just like they did. When anyone was hostile, I did not hit back. So people started calling me “mego,” that is mother [in the Acholi language]—at that time you had to earn the title. So even when talking to Kony, when he was really worked up sometimes, he would say mama and soften his voice. There is something about women being emotional, softening and patient. Patience is a virtue in all of this, which women bring to the table. Enough: I would love to hear your reactions to the recent developments concerning the LRA crisis, in particular the involvement of U.S. military advisors and how you think this is influencing Kony. Bigombe: Definitely the presence of the Americans has sent a very strong message. Kony listens to radio BBC and Radio Mega [an Acholi radio station] religiously, and it is so important that there is something in the news at least once a week, because that is sending him a very strong message. He is extremely scared; he probably thinks that the Americans have many people looking for him. Kony is going to run away from the region. He will very likely—and this is purely me speculating—he will very likely to move towards Darfur, where he was before. I don’t think Khartoum is helping him directly; [Sudanese president] Bashir has too much on his plate, and he cannot afford that. But I am certain Kony is going to leave the region within the next weeks or months and leave very few of his people behind. What makes it difficult to determine exactly where he might go is the access to food. The LRA live on wild fruits, root plants, berries, and yams. But I am sure he will leave the region. Enough: Being a mother yourself and an African woman, how do you see the role of women in Africa and their opportunities going forward? Bigombe: There is more recognition of women, generally everywhere, and women are getting into top positions now, with international organizations and with governments, but we still have a long way to go. I don’t just support numbers. What I want to see is that those women are in a position where they can deliver. I’ve worked for international organizations and saw how some women were treated, which made some women think that for them to succeed they had to behave like men, which is not the case either, but that is survival.